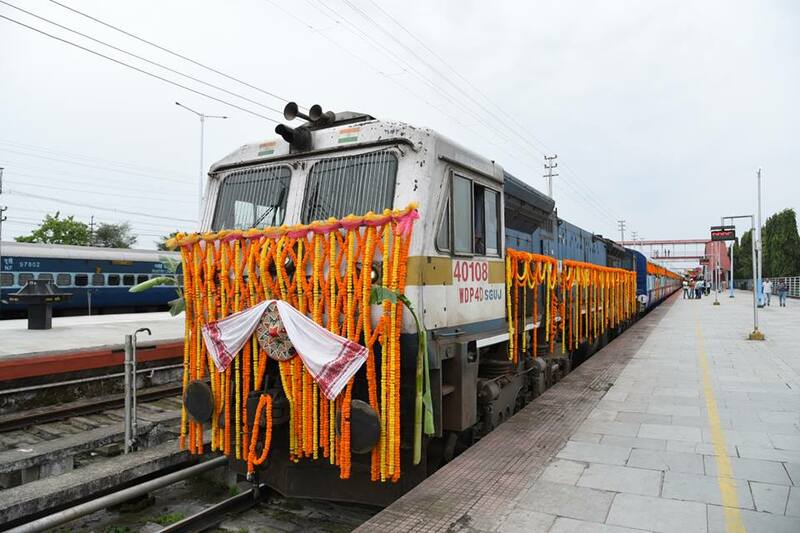 Assam Chief Minister Sarbananda Sonowal along with Union Minister of State for Railway Rajen Gohain on Sunday jointly flagged off a new express train service between Dibrugarh and Silchar heralding a new era of overnight communication between the two cities of Upper Assam and Barak Valley respectively. Chief Minister Sonowal and Union Minister Gohain flagged off 05944/ 05943 Dibrugarh-Silchar Express at a function at Dibrugarh Raliway Station. The weekly train will run every Monday from Dibrugarh and every Tuesday from Silchar and between two destinations the train will have stoppages at Sivasagar Town, Simalguri, Mariani, Dimapur, Lumding, New Haflong and Badarpur stations. Speaking on the occasion, Chief Minister Sonowal termed the day as a historic in the annul of Barak and Brahmaputra valley connectivity. Sonowal said that under the leadership of the Prime Minister Narendra Modi, Minister Gohian has been able to bring 46 new railway projects involving total project cost of Rs. 89601 crore to the Northeast. He said that out of the 46 projects 25 projects have been earmarked for new railway lines in the region. He thanked Prime Minister for taking special interest in development of N.E.Region by allocating more than Rs. 90,000 crores. Chief Minister Sonowal also said that with the introduction of the new train a new bridge of connectivity will be forged between Barak and Brahmaputra. Minister Gohain in his speech expressed hope that the new train will be very helpful for students studying in universities, medical colleges and engineering colleges apart from businessmen etc. “It will also be helpful for people of Mizoram, Manipur and Arunachal Pradesh,” he said. The regular service of the train will start from April 16 from Dibrugarh and from Silchar on April 17. Train number 15944 Dibrugarh – Silchar Express will leave Dibrugarh every Monday at 7 pm to arrive at Silchar at 08-40 am on Tuesday. During return journey the 15943 Silchar – Dibrugarh Express will leave from Silchar every Tuesday at 10-15 pm to arrive Dibrugarh at 11-20 am next day. The train will have AC 2 tier, AC 3 tier, sleeper class and general second class accommodation facilities.